Vycor Medical, Inc. (“Vycor”) (OTCQB: VYCO), a provider of innovative and superior surgical and therapeutic solutions, announced that it has entered into an agreement with HealthSouth Corporation (HLS) to make available its NeuroEyeCoach Professional Center therapy program to participating HealthSouth hospitals, following a 3-month trial of the therapy in two HealthSouth locations. NeuroEyeCoach is NovaVision’s eye movement compensation therapy for those patients who have suffered a cerebral visual field disorder as a result of a stroke or brain injury and is designed to improve a patient’s ability to scan their environment more efficiently. The program is based on several decades of scientific research pioneered by Professor Josef Zihl at the Max Planck Institute in Munich that has been the subject of numerous clinical studies. Participating HealthSouth hospitals will use the program to treat patients while in their care. In contrast to other clinic-based saccadic programs, NeuroEyeCoach is a full-course therapy dedicated to cerebral visual field disorders and can be continued by the patient in their home environment. This agreement follows the approval by HealthSouth in late 2014 to make available its VIDIT diagnostic to their hospital network and NovaVision is installing devices into this network. The NovaVision VIDIT is the diagnostic component of the Company’s Vision Restoration Therapy (VRT) and is used to perform high-resolution visual field tests to screen for central visual field deficits commonly associated with stroke or brain injury. The ability for Health South physicians to be able to quickly identify visual disorders through the effective screening program is highlighted by the fact that approximately one-third of stroke or other brain injury patients suffer from a neurologically induced visual disorder and if this deficit goes undetected it may adversely impact other rehabilitation modalities. Early detection and treatment are critical steps towards improving overall patient care, a key objective of HealthSouth. Once diagnosed, patients are able to be treated in-clinic with NeuroEyeCoach and referred to NovaVision for treatment following discharge at home using VRT, which is the only FDA cleared clinically supported therapy targeted at the restoration of lost vision resulting from neurological brain damage such as that resulting from stroke. HealthSouth (www.healthsouth.com) is one of the largest providers of post-acute healthcare services in the U.S. 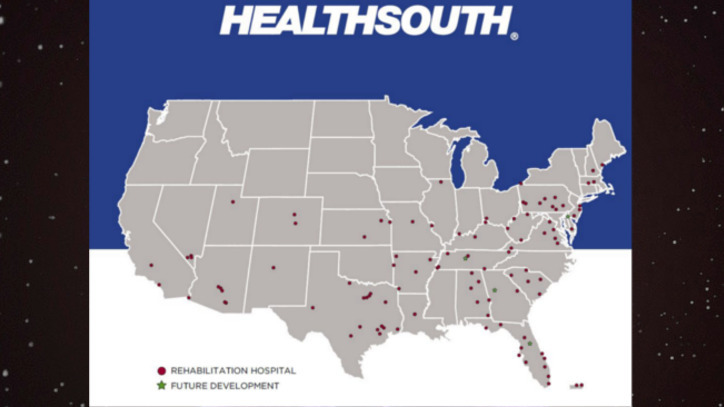 These two agreements therefore provide NovaVision with a source of installation and rental income but equally as important is a potentially large source of patients; most stroke patients will touch a rehabilitation center at some point and HealthSouth is the largest network of stroke rehabilitation hospitals in the U.S. This announcement follows NovaVision’s press release in March that it had completed development of VRT 7.0, re-engineering the therapy to be internet-delivered and streamlining business process to enable a significant reduction in cost to the patient. NovaVision will provide VRT and NeuroEyeCoach in one therapy suite. NovaVision will very shortly be commencing accepting patients with the new therapy suite which is considered by management to be the most affordable, clinically supported, comprehensive therapy suite available on the market to address visual disorders arising from stroke or brain injury. With corporate headquarters in Boca Raton, FL, Vycor Medical, Inc. (“Vycor”) is a publicly traded company (OTCQB: VYCO) dedicated to providing the medical community with innovative and superior surgical and therapeutic solutions and has a growing portfolio of FDA cleared medical solutions that are changing and improving lives every day. The Company operates two business units: Vycor Medical and NovaVision, both of which adopt a minimally or non-invasive approach. Both technologies have exceptional sales growth potential, address large potential markets, have the requisite regulatory approvals and are commercialized and generating revenue. Vycor Medical’s ViewSite™ Surgical Access Systems (VBAS) is a suite of clear cylindrical minimally invasive disposable devices that hold the potential for speedier, safer and more economical brain surgeries and a quicker patient discharge. VBAS is designed to optimize neurosurgical site access, reduce patient risk, accelerate recovery and add tangible value to the professional medical community. The company is ISO 13485:2003 compliant, has U.S. FDA 510(k) clearance for brain and spine surgeries and full regulatory approvals for brain in Australia, Brazil, Canada, China, Europe (EU – Class III), Korea and Japan and is seeking or has partial regulatory approvals in India, Russia, Taiwan and Vietnam. For an overview of Vycor Medical’s VBAS see: VBAS Video. NovaVision develops and provides science-driven neurostimulation therapy and other medical technologies that help improve and partially restore sight in patients with neurological vision impairments. The company’s proprietary Visual Restoration Therapy® (VRT) platform is clinically supported to improve lost vision resulting from stroke, traumatic brain injury (“TBI”), or other acquired brain injuries. VRT is the only FDA 510K cleared medical device in the U.S. aimed at the restoration of vision for neurologically induced vision loss and can be prescribed by any physician. VRT also has CE Marking for the EU. NovaVision also provides Neuro Eye Therapy (NeET) in the EU, aimed at increasing visual sensitivity deep within the field defect. The Company has also developed NeuroEyeCoach™, a therapy which is highly complementary to VRT™. The two therapies address different visual disabilities each of which results from neurologically-induced vision loss – a loss of visual field as well as difficulty with eye movement, affecting the ability to integrate visual information. VRT provides partial restoration of the patient’s lost visual field; NeuroEyeCoach™ is designed to increase the efficiency of eye movement and re-train the patients’ ability to integrate visual information between the left and right hand side. For an overview of NovaVision see NovaVision Video.